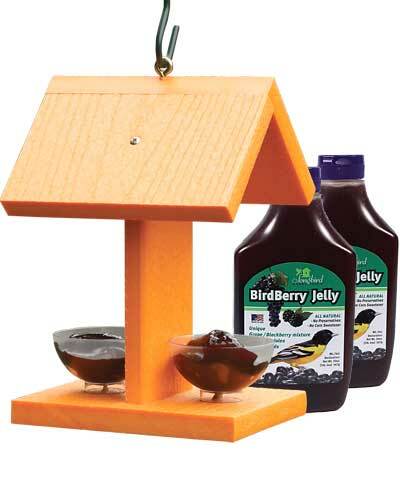 Keep the orioles in your area well-fed with this Going Green Oriole Feeder with Fruit Dishes and BirdBerry Jelly package. The classic shape of this feeder contrasts its bright orange tone and recycled plastic construction, while the included jelly makes it easy to keep the feeder full. Two clear, plastic dishes rest on a rectangular, base platform, creating two feeding spots on the Audubon Going Green Oriole Feeder with Fruit Dishes. A vertical panel between the cups handily supports the pitched roof, keeping the base protected from rain. Fill each bowl with 2 ounces of the included Songbird Essentials BirdBerry Jelly, which is great for attracting orioles and other fruit-loving birds. These squeeze bottles make it simple to fill the reservoirs, and the feeder hangs from the top eyehook easily. The recycled plastic construction of the feeder remains bold and durable for many seasons, and the orange hue aids in attracting orioles to your yard. Celebrate select songbirds and the environment with this Going Green Oriole Feeder with Fruit Dishes and BirdBerry Jelly. Items made in the USA.